As a mother, I have yet to find a happy medium between desperately needing time to myself and wanting to spend every minute with my little girl. My husband and I both work full time. But we work opposite shifts so that we don’t have to put her in daycare. Because of this, we usually get an hour overlap a day, before one of us is off to bed or work. We also don’t have the same days off. This has been hard on our marriage but not unbearable. But the way our schedules work out, I rarely get time to myself. As soon as I get home from work, we have dinner and then my husband goes to sleep while V and I hang out and eventually turn in for the night. I have an hour from when my husband gets home from work until I have to leave for it. Rinse and repeat. Sometimes, I can have an hour or two to myself on his nights off during the week, but he also needs time to himself. Some days, I cannot handle it. Some days I miss my husband. Some days I miss watching TV or playing video games or reading a book for pleasure. On the worst days, I face fatigue from being up all night with a fussy baby, exhaustion from a long day/week at work, being touched out from nursing V all night long, and being overwhelmed by normal household stress and having no time to recuperate. Some days, after struggling to get V down for what seems like forever, I need to lay her somewhere safe and walk away, drink a glass of water, breathe deeply. As she is crying for the second hour straight, I think back to how badly I longed for a child. I think of how silly the boredom of my pre-V days was. I dream of being able to lounge on the couch doing nothing, with no one touching me. Or of deciding to meet friends for dinner or drinks at the last minute, of not watching the clock to make sure we aren’t gone too long or past V’s bedtime. But when the storm clears and her sweet little face is peaceful with slumber, I am reminded of a terrifying fact. Sure, I won’t miss the screaming, whining or crying, but as those fade, so will the snuggles, the cozy nursing sessions, the milk coma smiles. So will the calming power of nursing. Soon she won’t want me to hold her close while she drifts off to sleep. Some day in the much too near future, she will roll her eyes at me as I tell her it is bedtime. Snuggles will be reserved for bad days or when she isn’t feeling well. Too soon I will be begging her to cuddle up in bed with me, even just for a few moments. One of my favorite depictions of Mary as the mother of Christ. 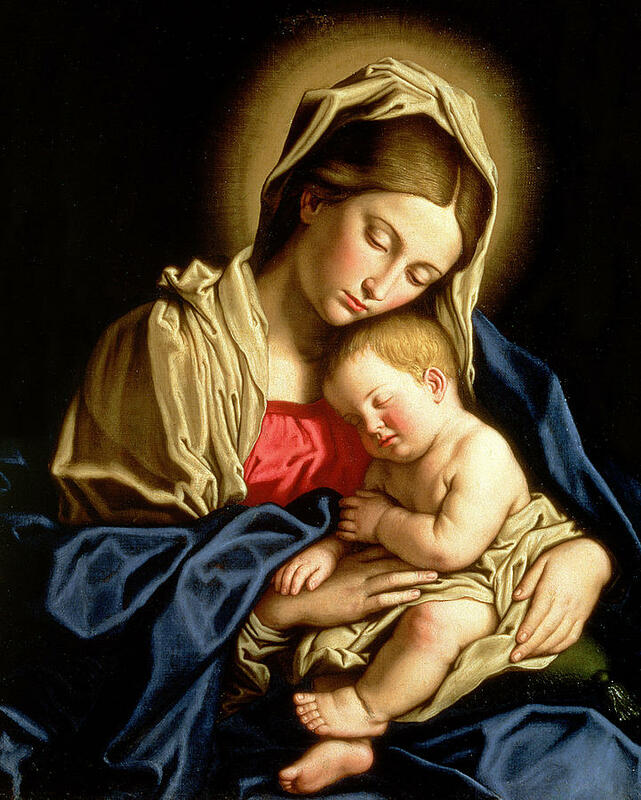 This is Madonna & Child by Sassoferrato, an Italian artist from the 17th century. Sometimes when V has fallen asleep and I am trapped underneath her but not yet able to drift off myself, I reflect on this and my thoughts fall to Mary, the perfect model of motherhood. I wonder if she too felt this tug of war between wanting desperately to be herself again and knowing what was to come for her precious little babe. I wonder how she dealt with the knowledge of what her Son was going to have to endure, how she peacefully went about her life as the mother of a young baby, then toddler, then child, knowing the pain she would endure with Him as His mother. What strength, peace and faith she must have called upon. I cannot imagine. What greater example is there to being a mother, enduring it all for the unconditional love of our children? Another favorite, also by Sassoferrato. This one, Madonna with the Infant Christ, includes Jesus holding a goldfinch on a string. The goldfinch was often used to symbolize that Mary and Jesus both knew Christ’s Passion was to come. I love this one because even with the crucifixion looming overhead, Mary looks so in love and at peace with her babe in arms. So I stare at her while she sleeps, trying to commit every bit of her serene image to memory, trying to preserve the entirety of these moments. The adorable way her little cheeks sag as she slowly drifts to sleep, how her eyelids eventually stop fluttering, the way she holds my finger as sleep consumes her. I pray that while she will certainly grow up, that she never grow away from me. And I pray for the strength and patience to never forget, these moments are fleeting. Holy Mary, Mother Most Admirable, pray for us! Lovely paintings. There’s a reason that the Madonna and Child were painted so often. And you’re right… savoring the little years are tough sometimes. Thanks for the encouragement. Yes I think I could look at paintings of Madonna and Child for hours. They are so beautiful and it is so interesting to see the differences between artists. Thanks for reading! I love this! Such a beautiful post, Sarah! These moments do go by soooo quickly!! Enjoy those cuddles with your V tonight! This is a great post! I love how transparent you are about your struggles before you shared the bittersweet truth that these moments truly are fleeting. Thanks Lauren! I think it is so important for moms to share their truths, the good and the bad 🙂 Thanks for stopping by!